August has been an unusually lucky month for me - I've won two blog giveaways, and was a prizewinner in a blog reading contest. 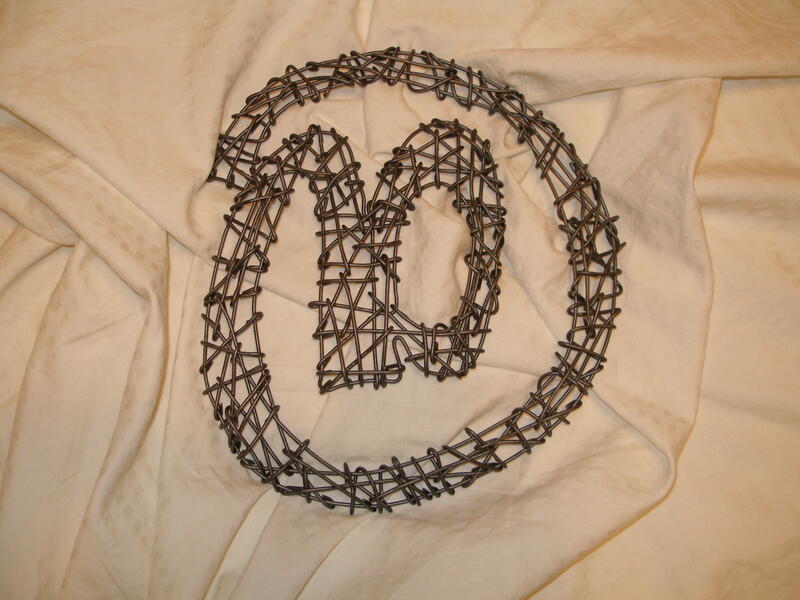 The wonderful wire sculpture of the letter "b" (is for becca's byline and for bookstack!) was a gift from artist and blogger Kristine Mays, who writes at notes from the laundromat. Kristine works in wire, and as I hold this piece in my hands, I'm in awe of the skill and patience it must take to create these artistic renderings. You can't know how much I cherish these kinds of gifts, for I have absolutely no artistic talent of this kind. I clearly recall my elementary school art classes, which were almost as nerve-wracking for me as math class. None of my projects ever turned out the way I wanted them too, and I spent many tearful, frustrating times working away, usually making them worse in the process. My winning streak continued when Gautami emailed to tell me I had won a signed copy of Matrimony, a novel by Joshua Henkin. After reading her review, I was really excited to read this book, so I'm eagerly watching my mailbox for that to arrive. I'll be reviewing the book, and hosting my own giveaway of an autographed copy (courtesy of the author!) sometime in October. I'll keep you posted on the details. THEN, last but not least, yours truly was the "silver medalist" in the Olympic Reading Challege, which I participated in over at Bookstack, my book blog. My prize (an Amazon gift certificate!) has already been spent on - a book! what else?? And now, before my lucky August runs out, I'm off to my local convenience store to buy a lottery ticket.